Body Composition Analysis is the technical term used to describe the assessment of the different components that, when taken together, make up a person’s body weight. The human body is composed of a variety of different tissue types. The so-called ‘lean’ tissues, such as muscle, bone, and organs are metabolically active, while adipose (fat) tissue is not. Scientists have been studying body composition since the beginning of the 20th century, but research has increased dramatically in the last 25 years as methods for measuring and analyzing the body have grown in accuracy. There is growing evidence that clearly links body composition with health risks and the development of certain diseases. New research indicates that fat loss, not weight loss, can extend human longevity. BIA is a simple, quick, and non-invasive means of measuring body composition, making it particularly useful For group screenings. 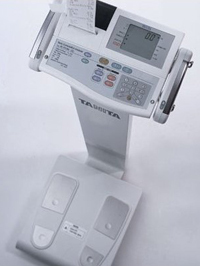 The Tanita BC-418 Body Composition Analyzer calculates “body fat ratio,” “body fat mass,” “fat free mass,” “Estimated muscle mass,” and “Base Metabolic Rate” using data derived by the DXA method using BIA. Through the use of 8 electrodes, the BC-418 Body Composition Analyzer makes it possible to show separate body composition mass for the right arm, the left arm, the trunk, the right leg and the left leg. The addition of handgrips to Tanita’s standard platform-based electrode system allows the body composition analysis to calculate regional body composition. This empowers healthcare professionals to better determine health risks associated with visceral and abdominal fat of Basal Metabolic Rate, instead of simply relying on weight, age and gender. Assessing your body composition can helps us determine the best way to help you improve your overall health. We can suggest routine changes to diet and exercise to put you on the right track to healthy living.